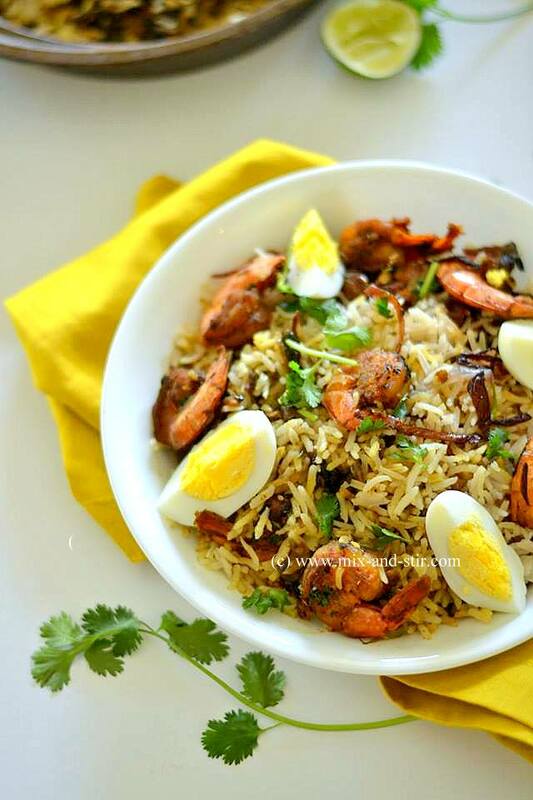 Biryani, a very popular Indian dish, is based off rice, generally made with spices, flavored rice and any one of the following items - chicken, mutton, beef, eggs, fish/ seafood or vegetables. It’s served with dahi chutney or raita (yogurt based chutney), salad and with some curry. The word Biryani is derived from the Persian word Berya (n) that means fried or roasted. It is considered to have been invented in the kitchen of Mughlai. The special spices used in Biryani are ghee, nutmeg, mace, pepper, cloves, cardamom, cinnamon, bay leaves, coriander, mint leaves, ginger, onions and garlic. It has got endless variety of style and process. 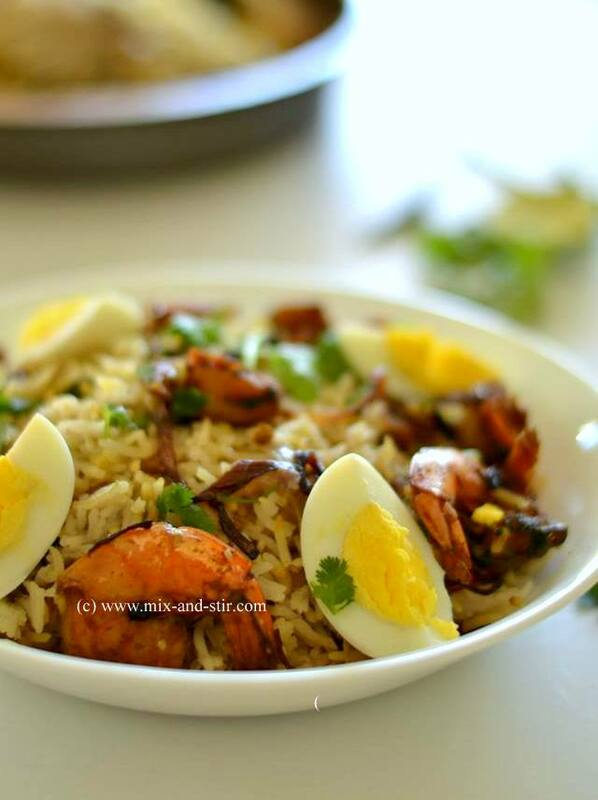 I cooked this version with Prawn and in Malabar style, inspired by a Malayali cooking site. 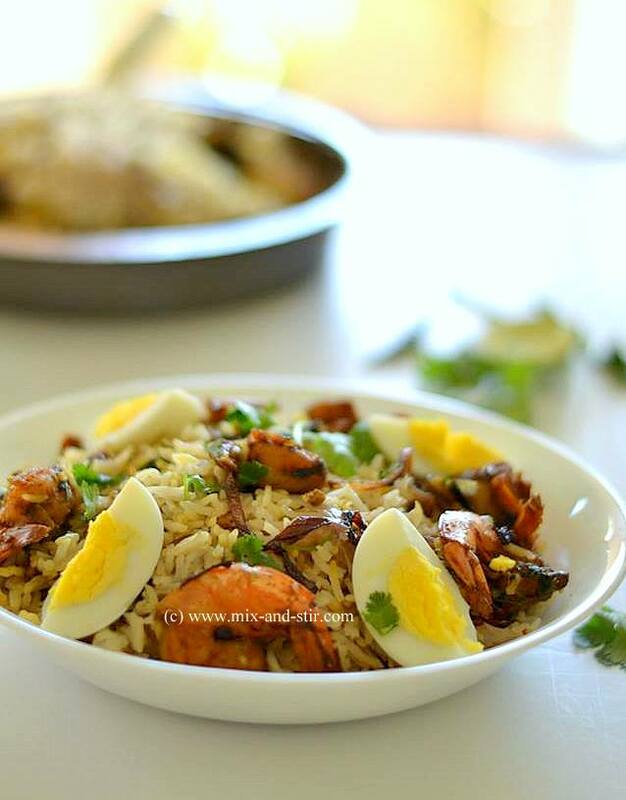 Another similar rice based dish is called Prawn Pullao. The main difference between Pullao and Biryani is, while Pullao is made by cooking the items together, Biryani means a dish where rice and a curry of meat/fish cooked separately, then brought together and layered. This gives the dish a contrast of flavored rice and intensely flavored meat/ vegetables. 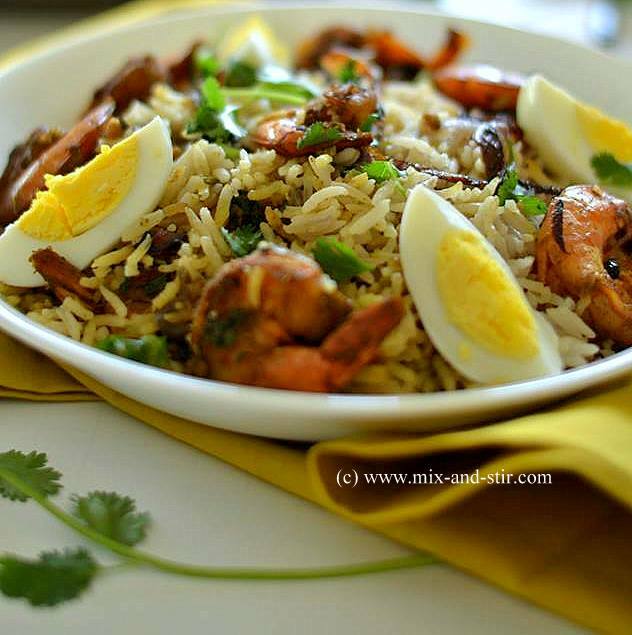 I cooked chicken/mutton Biryani several times, but few months back I tried Biryani with prawns for the first time and liked it very much. This single dish is enough for your lunch or dinner. The final dish comes up dry or minimally moist. I have used the home-made Biryani masala powder here. If you are in a hurry, replace it with ready-made Biryani Masala Powder that is available in all Sub-continent style grocery stores. Try to use Basmati Rice of best quality and the rice grains shouldn't be broken, rather be full cooked but not mushy. 1. Grind all the ingredients for making Biryani Masala powder to a fine powder. You may skip this stage by using ready-made Biryani Masala powder, but home-made masala adds extra flavor. 2. Wash and drain the rice on a paper towel. Add Ghee in a big skillet, heat it up and add the thinly sliced onions to it. Saute the onion till it is transparent, add the rice to it and stir continuously for 2 to 3 minutes over a low heat. In a heavy bottomed vessel add water, once it starts to boil, add the rice-onion mixture, add salt and cover it. Let it cook over low to medium heat until rice is fully done and water is completely absorbed. Using a fork gently separate the rice, so they don't get sticky. 3. Sprinkle salt and turmeric on cleaned prawns, mix it well with them and leave it for 10 to 15 minutes. 4. Heat oil in a pan, add a thinly sliced onion and fry it til it get nice brown color over medium heat and set it aside. 5. In the same pan add oil, once oil is ready add the marinated prawns, shallow fry them till they get a nice pink color, then remove from oil and keep it aside. 6. Add sliced onions to the leftover oil and saute it, till they change color to light brown, add ginger, garlic and chopped green chili peppers and cook them until raw smell goes off. 7. Add coriander powder and 1 and 1/2 tbsp biryani masala powder, stir well and add few tablespoon water and let it cook for 3 to 4 minutes. Add salt, stir well and cook the whole thing, til oil separates from the sides of pan. 8. Add the prawns, stir well for another 2 to 3 minutes, add the chopped cilantro and mint leaves. Stir again and let everything come together. Turn off the gas, add lemon juice, mix well and keep the pan aside. 9. 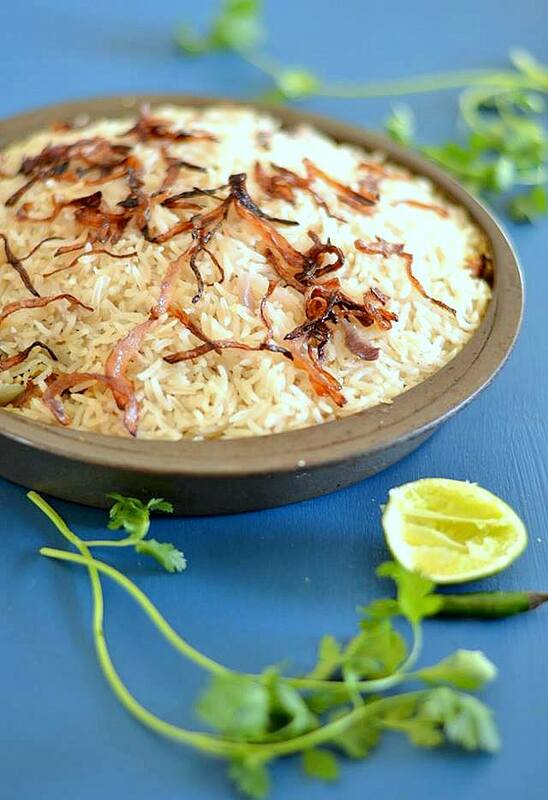 Layering or final cooking : Preheat the oven to 350 degrees F or 176 degrees C. Take a oven-safe dish, put 1 tbsp ghee into the dish and spread half of the rice at the bottom, followed by prawns, sprinkle biryani masala then put rest of the rice. Sprinkle the fried onions on the top and cover it tightly with aluminum foil and let it cook in the oven for 30 minutes. 10. 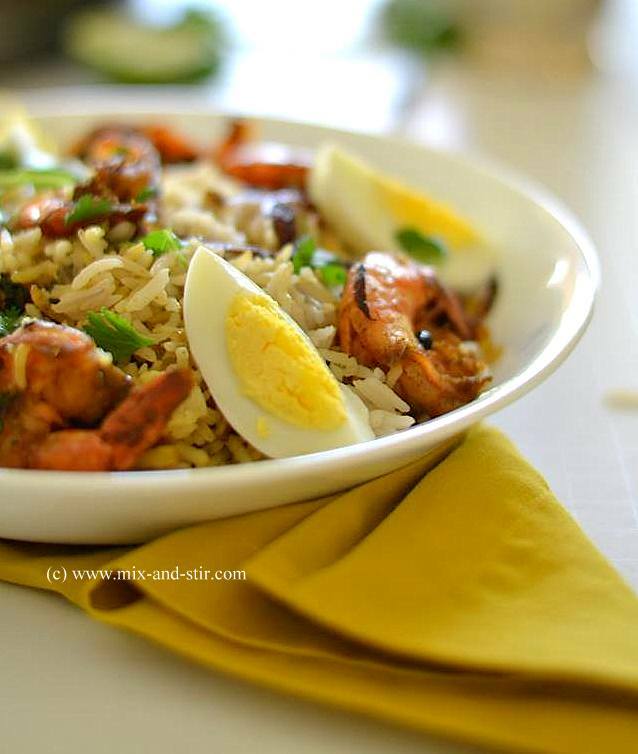 Once it is done, let the dish covered for again 15 to 20 minutes on the kitchen counter then mix the rice and prawns gently together and decorate with boiled eggs, sprinkle some chopped cilantro and serve. Hi came across this page today. Very interesting recipe. Keep posting.